This version of Tolkien's "The Road Goes Ever On" seems appropriate as 2014 comes to an end and 2015 approaches. The Tolkien Gateway, a network and encyclopedia that says anyone can edit it, includes a page with an appropriate look at the walking song, "The Road Goes Ever On" fictionally written in three versions by Bilbo Baggins in the last chapter of The Hobbit as he's finally returning to the Shire; the version I posted here is when Bilbo in The Fellowship of the Ring sets out for Rivendell and later slightly changed by Frodo; and a final version at the end of the trilogy again by Bilbo. J.R.R. Tolkien's The Hobbit was turned into three movies by Peter Jackson -- as many as the three films he made of The Lord of the Rings Trilogy -- but finally in 2014 even that had to end. I don't know if the Gateway's future will ever end, but Tolkien lovers have plenty of resources there. It currently has 11,329 articles, 41,774 pages and 8,711 images. They are careful about copyright, but don't seem worried about the Tolkien estate suing for copyright infringement, so I trust my giving the version I used here is acceptable and considered Fair Use. On Facebook a great idea for the coming year is highly adaptable for storytelling or life on the Road That Goes Ever On. 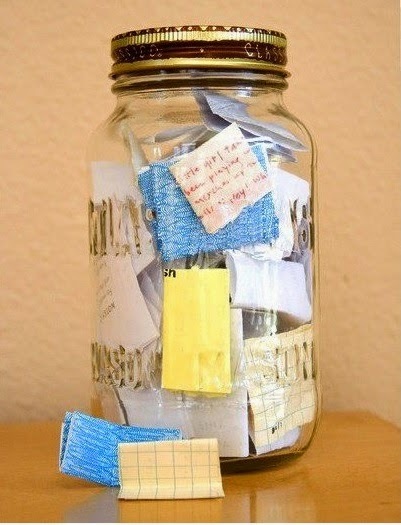 "This January, why not start the year with an empty jar and fill it with notes about good things that happen. Then, on New Years Eve, empty it and see what awesome stuff happened that year. Good way to keep things in perspective! ~Krystal~ — with Dorinda White." That message has been shared by many on Facebook. It took a bit of prowling to find it apparently originated with Dorinda White and Krystal and was posted on The Pagan Circle page. As a storyteller I see various storytelling ideas in it. Put your story ideas there, too. I'm not too inclined to write stories about my life, but that might change with a jar of "good things that happen" or I might toss in ideas for original stories as I am inclined that way. Yes, your teachers who required journaling might have been suggesting something roughly the same, but journals and diaries seem to require constant regular input. This is a bit more sporadic, spontaneous, and doesn't require more than writing just enough to later know what happened. Prefer techie methods? Get an app for notes or use Evernote. Here's an article to help you find anything in Evernote if it becomes like an overstuffed file drawer. While you're at it, does your cell phone have a voice recorder for taking notes? That or a mini-voice activated tape recorder could go with you hiking with your dog or hands free while driving. As local storytelling friend and current president of the Detroit Storytelling League, Loretta Vitek, puts on her business cards and email signature, "There is always a story, be a shame not to share it!" She grew up in an Italian storytelling family. In contrast I sometimes say I became a storyteller because families like that were so different from my own upbringing and I felt "story deprived." Maybe that's why she is comfortable with personal storytelling and I'm not. Still I do enjoy story creation, so even if it's not personal happenings, the jar or Evernote deserve to become a new habit for 2015. Of course I also love the other comment Loretta couples with the previous message: Do not meddle in the affairs of dragons, for thou would be crispy and good with sauce." May 2015 bring you only the best stories! Lots of good stuff here, Lois. I'm going to check into Ever Note immediately. Thanks Lois. I'm on the look-out for the right jar now!